I just came back from a two week vacation in Cambodia that was marvelous and amazing and all kinds of wonderful. If you’re interested, there are pictures posted here. 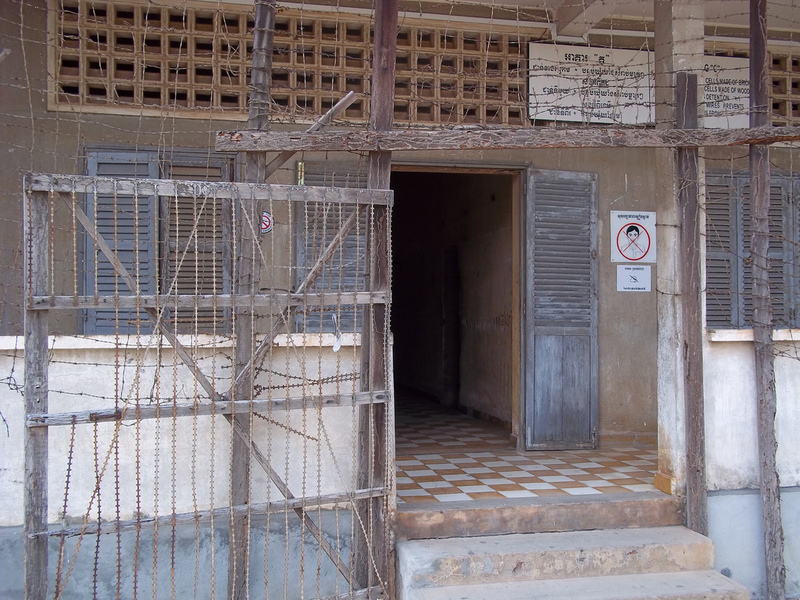 I saw some remarkable heritage sites and museums, and the one that had the most impact was Tuol Sleng. Nothing defines modern Cambodia as much as the almost five years when the Khmer Rouge under Brother No. 1, Pol Pot, tried to destroy the country and remake it as a socialist agricultural state, where Angkar, The Party, controlled everything and everyone. Any conversation with a Cambodian that lasts long enough will eventually pull in events that happened “in Pol Pot time” or during “Khmer Rouge regime” and will inevitably include people killed. It touches everything that happens in the country, and the fact that the trials of the surviving Khmer Rouge leaders is still grinding its way through the international courts doesn’t help. The Killing Fields, the grounds outside of Phnom Penh where enemies of the party were executed and dumped in mass graves, are the most recognizable symbol of the horrors perpetrated by the Khmer Rouge. 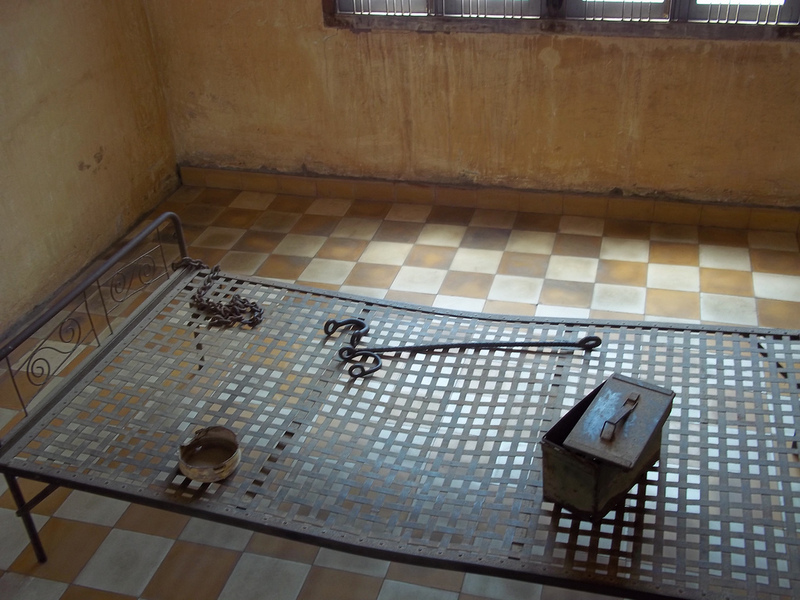 The place most of the those victims came from is now operated as the Tuol Sleng Genocide Museum. I’m not sure I’d call it a museum. But I’m not sure names matter in this case. 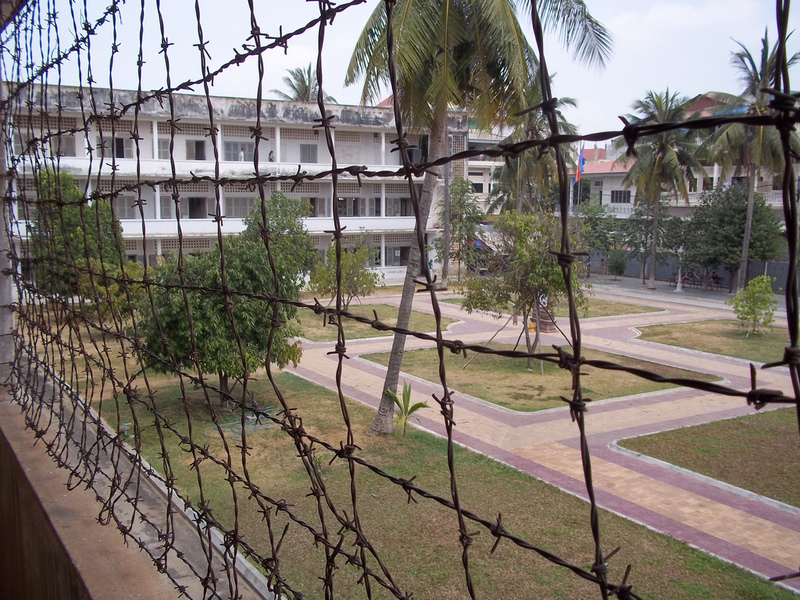 Chao Ponhea Yat High School was appropriated by the Khmer Rouge after they overthrew the government and turned into Security Office 21, or S-21, a prison for high-ranking officials of the old regime, intellectuals and Khmer Rouge accused of betraying the ideals of the Party. In less than five years, 20,000 prisoners were brought to Tuol Sleng. 7 survived. The rest were tortured, forced to make confessions of alleged crimes against Angkar, and taken out of town to be killed. 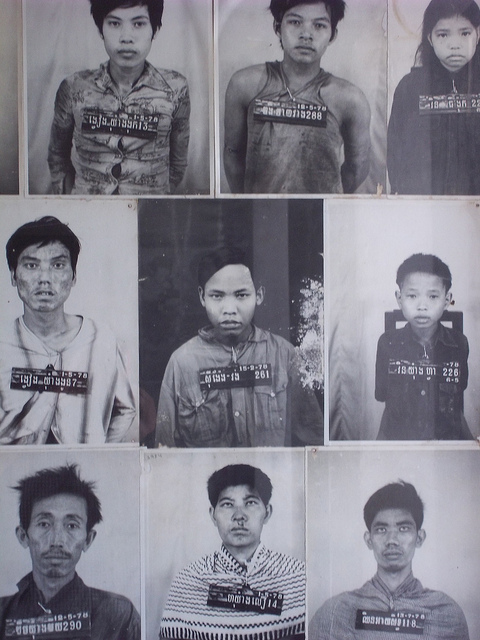 The vast majority of the victims were ordinary Cambodians. The Khmer Rouge were as ruthless about purging their own ranks as they were about cleansing the rest of Cambodian society of anyone who might question or resist the Party. Out of a total population of 7.3 million, the Khmer Rouge caused the deaths of 2 million, through murder, forced migration, starvation and military operations against her neighbors. As bad as the death toll was, it is sobering to think how much worse it might have been if the Vietnamese Army hadn’t invaded Cambodia in 1979 to crush the Khmer Rouge. 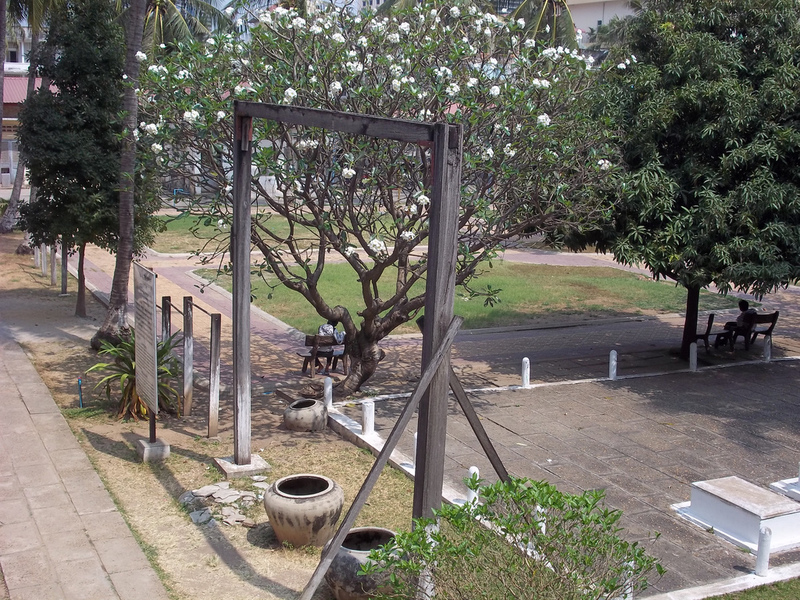 You won’t learn much of this history at Tuol Sleng, unless you hire a guide to take you around. For the regular visitor like me, what there is consists of the school buildings and grounds, preserved as they were found when the Vietnamese took Phnom Penh. Part of the impact of the place is how recognizable it is. It looks like lots of other Cambodian schools, A few buildings with shaded walkways surrounding quadrangles of grass with palm trees shading them, surrounded by a wall. You have to look closely to see signs of it later incarnation – the wooden frame that was used as a gallows, the chicken wire stretched over the front porches to keep prisoners from jumping to their deaths or escaping. Near the front gate are fourteen cement tombs containing the remains of fourteen unidentified bodies left behind in their cells when the Khmer Rouge fled, still chained to their beds or left where they were killed. 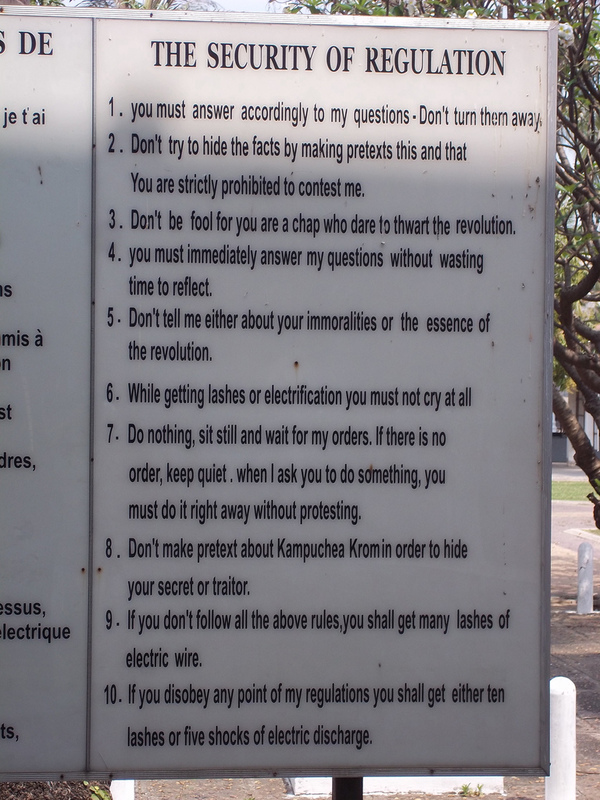 By the tombs has been erected a large sign in Khmer, French, and English which lists the prison regulations the jailers repeated to prisoners. When you enter the first building, where important prisoners were questioned, all you find is a rusted bed, some bars and chains, an old ammo box or bowl would have been the prisoner’s toilet, and a gruesome photograph of how the Vietnamese found the prison. The photographs are hard viewing – bloated tortured bodies in pools of blood on the bed, or next to the bed, which they were chained to with the steel bars and chains piled on the bed. The rooms have been cleaned of the bloodstains, but once I made the connection between the scenes in the photographs and the room I was standing in, it was impossible to escape the realization that bad things happened right where I was standing. People had been tortured to death, lots of them. The rest of the building was the same way. 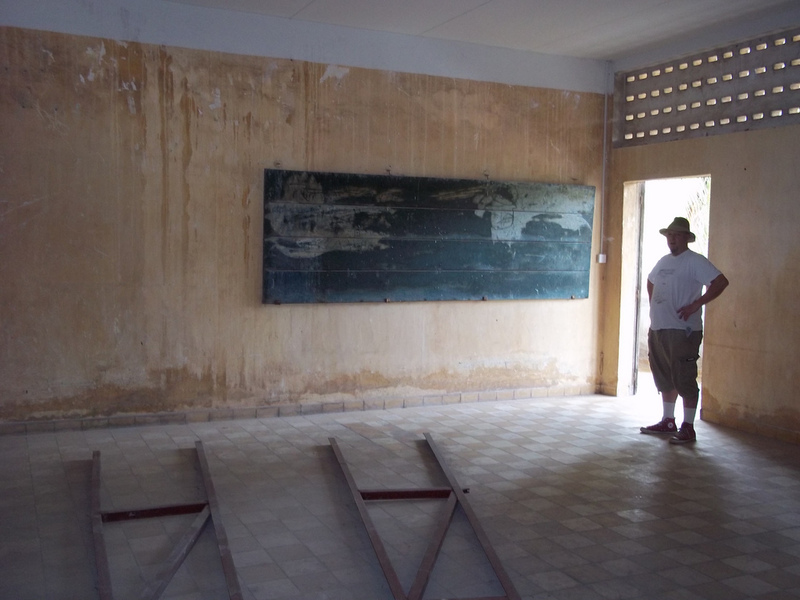 Some rooms still had blackboards in them and traces of the Khmer alphabet painted on the walls. Upstairs were more cells, smaller cells, and nothing else. You could stand inside them and realize how small they were. You could look out the windows at the coconuts hanging in the palm trees outside. More interpretation probably would get in the way. Classroom turned into interrogation chambe, blackboard still on wall. In the next building, the interpretation, such as it is, gets more overt. Huge two-sided panels fill the classrooms. 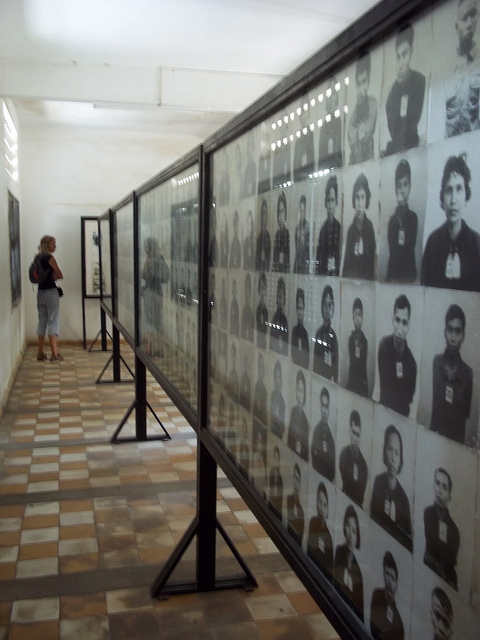 Each side is filled with mugshots of the prisoners taken when they were brought to Tuol Sleng. Almost none are identified, aside from ID numbers pinned to their clothes. Men, women, girls, boys, mothers with infants look out at you with every expression imaginable. Many have their arms bound behind their backs. Some have been beaten. Some seems surprised, others smile, a few look stern and defiant, the rest blank with the realization of their predicament. Room after room of them, all looking out at you. The chair that prisoners were made to sit in to be photographed is in a dusty case with photographs of how the chair was used. A pile of discarded clothes completely fills a large case against a wall. And people of many nations silently file through. Tuol Sleng is a quiet place now. As luck would have it, two of the seven prisoners who survived Tuol Sleng were painters. Both had been plucked out of the mass of prisoners due to their artistic abilities and made to serve the Party by painting portraits of Pol Pot and other leaders and propaganda work. Since their release, they have painted what they lived through at Tuol Sleng and examples of their work hang throughout the place, like witnesses, saying, “This is what I saw happen here.” Several paintings serve as illustrations of how some of the strange-looking torture devices were used. Again, not easy viewing, especially with the devices right there, out in the open – waterboarding devices, drowning tanks, and other fiendish, scratchbuilt machines. The only interpretation to speak of were one-line labels. By now, the lack of information almost felt like a tangible presence, like I was witnessing the absence of knowing the horrors that occurred in that room. 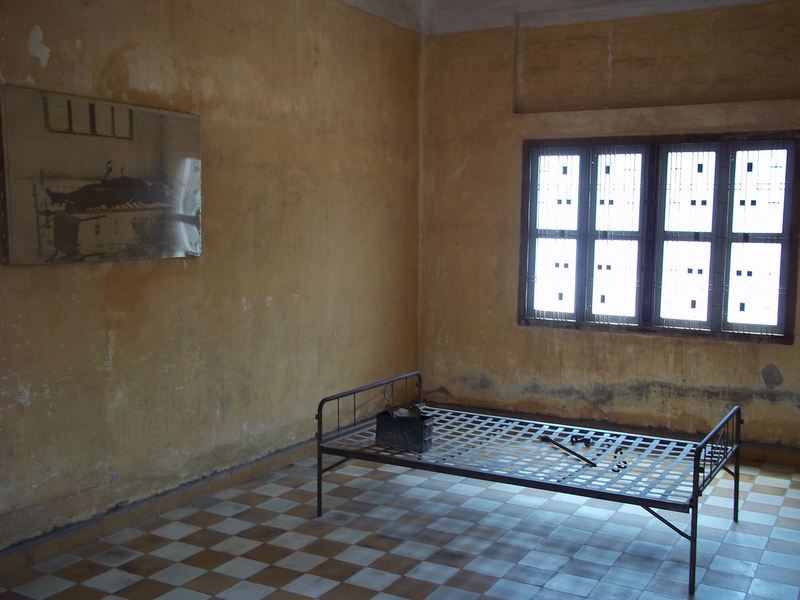 In vacant rooms upstairs, there were temporary exhibitions by modern European artists appropriating the portraits of prisoners to make their own statements about the events that happened at Tuol Sleng, complete with artists’ statements and modern Western graphic design that would’ve been at home in any gallery in the U.S. or Europe. They felt intrusive to me, out of place, and unresponsive to the place. By the time you get to the final exhibits, up on the third floor of the final building, the message changes again, and ties the events of 1975-79 to the present – Case 002. The Cambodian government has been trying to bring the remaining members of the Khmer Rouge leadership to justice for years. The indicted include Nuon Chea, former Deputy Secretary of the Khmer Rouge, former Foreign Minister Ieng Sary and his wife Ieng Thirith who served as the former Minister of Social Action, and the former Head of State and Chairman of the party’s Central Committee, Khieu Samphan. 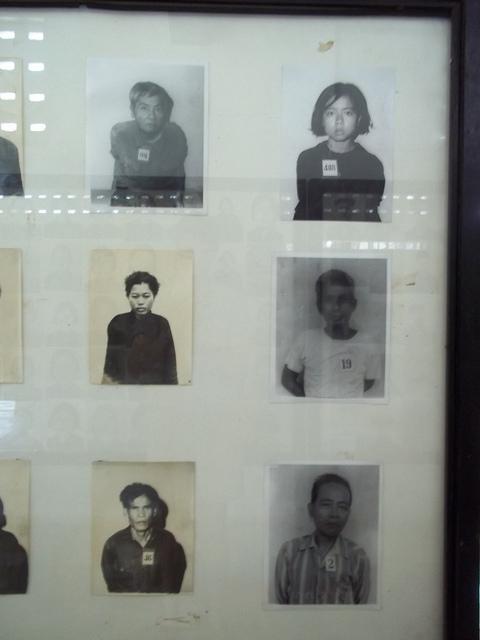 The exhibit on Case 002 opts to provide brief histories of each defendant, their role in the Khmer Rouge government, and one or two pieces of first-hand evidence, mainly letters written by the defendants. The voice of the labels is hard to determine, but the intent is clear. These people need to be convicted of crimes against their own people, and the outcome of the trials is still in question. The advocacy of the labels was both a little jarring and somehow completely acceptable. I think I totally understood how this guy felt. “What will happen?” is the question I was left with as I made my way back down to the courtyard where I could buy a Coke at the gift shop, and Khmer Rouge books, pirated DVDs, Khmer handicrafts, and T-shirts emblazoned with the international warning sign for minefields. Weird, and jarring. A piece of modern Cambodia intruding into the museum. You can buy that stuff everywhere. So what’s the takeaway message? If I’d been given the job of developing a content plan for the museum, what would I have done? And would it have been the right thing? As it was, I went home, fired up my browser, read up on Pol Pot, skimmed a couple of books on the Khmer Rouge, and gave myself as much information as I probably would’ve gotten from exhibit labels. The Cambodians don’t need to be told. They know what happened. The other tourists? Good question. I don’t know many sites that are that potent. Tuol Sleng works because it is Tuol Sleng. It needs no introduction or interpretation. You just need to go and see. Anybody else been to Tuol Sleng? It’s not the kind of place that inspires conversation while you’re there, but now having some distance from it, I feel that I missed something by not talking more with other visitors. Next Post: Look outside your field! What’s going on in the world around you? Just reading your post, gives me the sense of what it must have been like to walk through those rooms. I imagine you were a bit exhausted after that experience. What if there were an area outside with stools and a vendor of some sort (coffee, juices) and a guide (which language?) to answer questions. Might be good for continuing the discussion, giving context. I haven’t yet been to Cambodia. If you haven’t yet read First They Killed My Father, I recommend that. Stays with you. Thanks for sharing your experience. I haven’t been to Tuol Seng, but thank you for writing of it. It sounds like a powerful and incredible experience. Thanks for the lead, Amanda. My curiosity about these kinds of sites has increased, so it’d be interesting to see what kinds of patterns he might be seeing. You should definitely interview him for the Tufts blog. I thought it was interesting that you mentioned in your blog the lack of dialogue between yourself and other visitors at the museum. I think this site would be a great place for the International Sites of Conscience to affiliate with. I’m honestly conflicted about whether more dialogue would be a good thing, or just another imposition. I can sympathize with the Western visitors who felt compelled to scratch their prayers and pleas for justice in stairwell walls, and I can also appreciate the need to let the site speak for itself and not become another place to “have a conservation about” a difficult topic. Maybe, someplace adjacent to the site? I don’t know. I still struggle with the experience. I’ve been there about 20 times. I guide in Cambodia quite often. I don’t go in anymore with my clients. The last time I was there was a couple of years ago and I noticed the torture chair is now behind glass because of too many tourists photographing themselves. Truly sick. The map with all the skulls is gone too. It’s really a horrific place to visit, but required. The difficult part for the Khmers is coming to grips with this diabolical event in their lives that still seriously affects them to this day. There has been no justice. There has been no closure. Nothing. I personally don’t advise a place to ‘sit and talk” about what you have just observed. People are too shellshocked to come out and have a coffee, tea or a coke and strike up a chat to properly relay their feelings of horror. They need time to process it. Did you speak with some of the Cambodians? They are very open and will offer their perspectives and experiences without reservation. I also don’t think (and agree with you) we visitors need to, or should ‘change” anything. It is not our place to change anything. I can totally sympathize with you, Karen. Some very rare places (like Tuol Sleng) you go to because you need to bear witness to what happened, even if it is just feeling discomfited for an afternoon. All these months later, I’m still conflicted about what I’d do if I worked there. I saw the place without a guide, and know I missed a lot. The interpretation is truly minimal and often in Khmer, but the power of the place *is* the place. Interpretation might get in the way. I dunno…. A visitor center outside the compound would be a plus. That way all the tacky but vital concessions could occur off the grounds of the school. A visitor center could also be a place to engage or not in a more neutral setting than Tuol Sleng itself. We have visited tuol sleng museum and that was one experience that was beyond words. Even after the visit, and we were already in another place in Cambodia, the memories of the cells and pictures continued to haunt us. Thank you for sharing your experience, too. For some reason, 500-odd people visited this page yesterday, which, while gratifying, is a little strange. Is somebody teaching a course on modern Cambodia or something? I am curious! Cracked.com posted an article about this place. I must say, it caught my attention and I wanted to learn more about it. I will be traveling to Cambodia/Vietnam at the end of December 2012 and a visit to Tuol Sleng Genocide Museum is part of the itinerary of the tour group I will be traveling with. I made a personal point of reading all I could about this museum to prepare myself for what I will see. I do hope others who will be traveling with me plan to do the same. Good for you, Debby. A word of advice? Don’t go first thing in the morning. It can really set a mood for the day. Definitely go, but find a time when you’ll have some downtime afterwards to reflect on it. 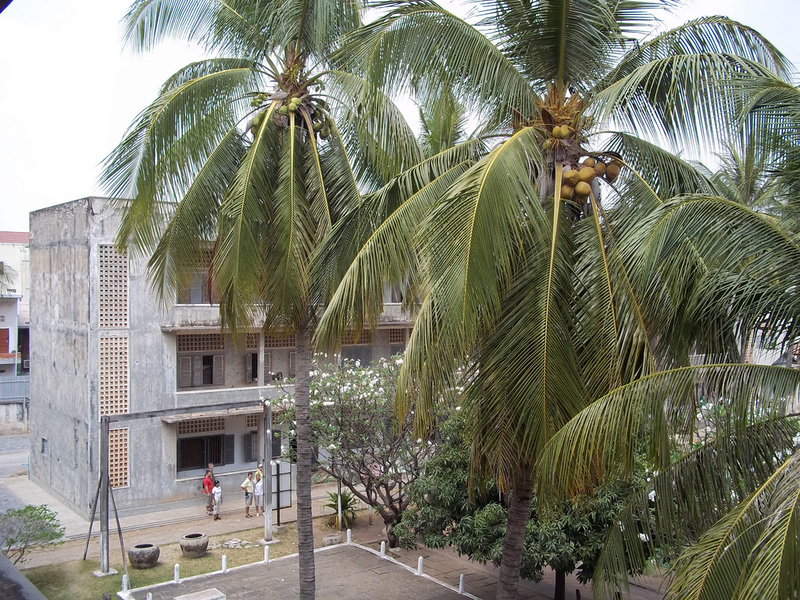 Ed I am writing up my Phd on WHY people visited Tuol Sleng – you knew it would be horrible so why did you go? Is there anyway you could articulate that? Certainly! Shoot an email to erodley at gmail dot com with what your questions are, and I’ll try to oblige.